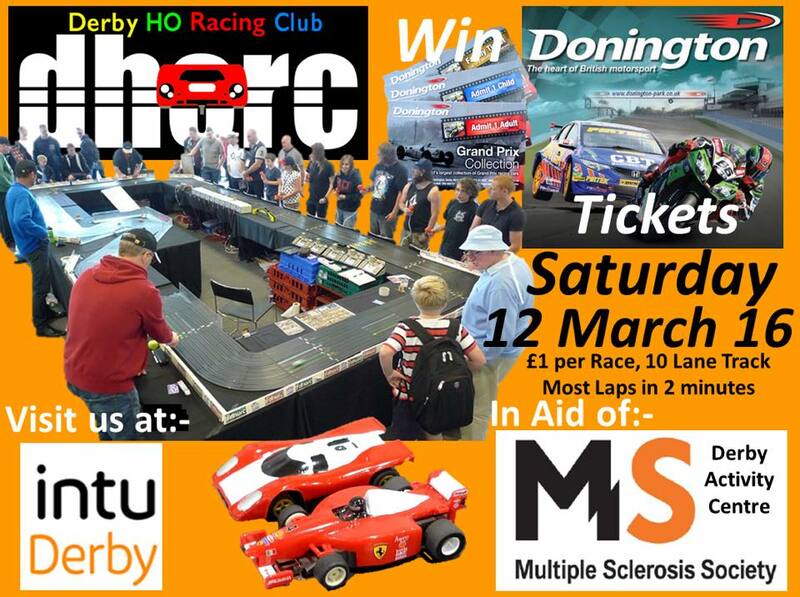 “We are running a ten lane ‘Scalextric’ track in the main shopping centre in Derby, intu, between 9am and 5pm on Saturday 12 March 2016 to raise awareness and support for the Derby Multiple Sclerosis Society. For just £1 you can win a family ticket to a 2016 Donington Park Race Weekend and a visit to the Donington Park Grand Prix Collection if you set the most laps in two minutes during the day. Everything is provided you just need to turn up and race. There are two categories 1) up to and including 16 years old 2) over 16 years old. 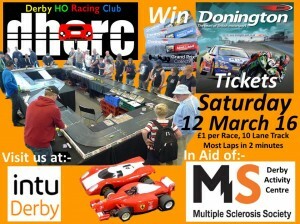 It should be a great day and we look forward to seeing big crowds throughout the day in aid of a good cause. Thank you”.